If you're like our family, you may have some rarely used "grown-up" games that could make perfect learning tools for your little ones. When I reorganized our front closet last week I found quite a few games with letter tiles. Most of these games aren't that much fun with only two people and Tim and I don't have very much free time for games these days. So I decided to repurpose these games for the time being and use them to help our kids practice letter recognition and letter sounds (and later begin to form words). Letter tiles from an educational store can cost a pretty penny, but you can easily find games second hand at thrift stores and yard sales. Here are the games with letter tiles that we already have on hand. These next three are newer so it'll probably be more difficult to find them second hand, but you may already have them in your game collection. To set up the game we simply filled the board with letter tiles and placed a tile holder in front of each player (the game comes with four holders). 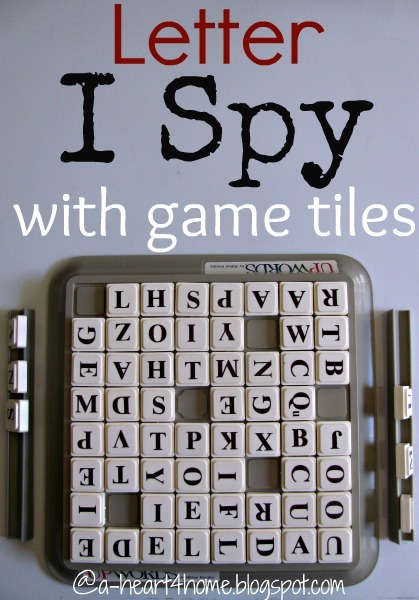 The first player calls out a letter they see..."I spy a D."
The player to their left looks for the letter, removes it from the board and places it on their own tile holder. Then it's that player's turn to call out a letter and the player to their left has to find it and place the correct letter on their own tile holder. Play continues to the left until either the board is empty (longer game) or everyone's tile holder is full (shorter game). 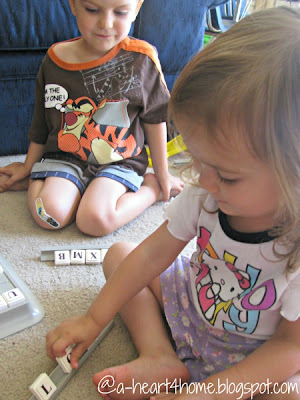 Our kids really enjoyed this simple game and I enjoyed that they were learning at the same time. Today's Questions: Do you have unused games that you could adapt to teach your children? What other ways could you use letter tiles to help your kids learn? We'd love to hear your ideas! 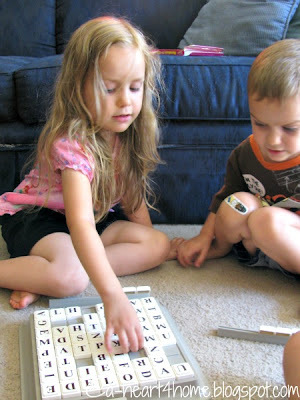 Such a great idea to use word tiles with kids! We have banangrams and love it :) would love for you to link up to our hearts&home link party at mercyinkblog.com! Wonderful idea!!! Boggle would work well too. This is such an awesome idea! I love when I can make use of what I already have! Now, why didn't I think of that:))) Thanks for sharing your great ideas! I look forward to more!